The Parrish welcomes groups and hosts hundreds of public, private, school, and group tours each year. We encourage groups to visit the galleries for self-guided or docent-led tours in English or Spanish. Stop by the Museum Shop, or the Café for a snack or lunch, before or after your tour. Docent-led public tours of the Permanent Collection and Special Exhibitions are scheduled at 2 pm, every Wednesday, Saturday, and Sunday. The tours are free with Museum admission; reservations aren’t required. On the first Sunday of the month at 2 pm, we offer bilingual family gallery talks and art workshops. Admission is free with Museum admission. Las excursiones se ofrecen el primer domingo de cada dos meses e incluyen una gira bilingüe en inglés/español. Gratis con entrada al museo. We offer reduced admission for groups of 10 or more. If your group is larger, please break out into smaller parties of no more than 10 people. Please provide us with at least two weeks’ notice of your group tour date. 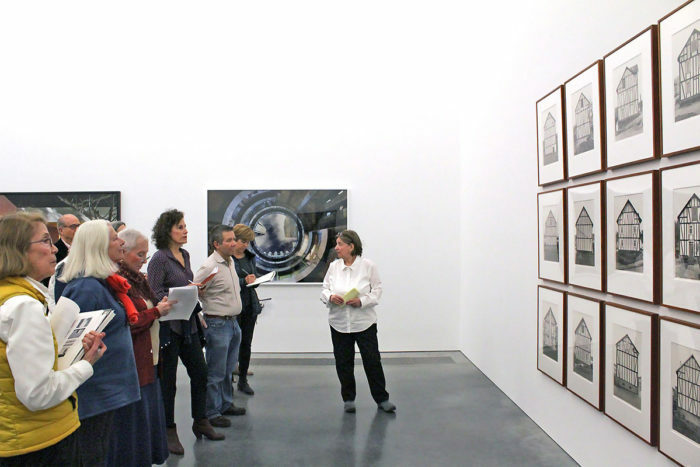 Guided tours of the Parrish architecture and exhibitions can be easily arranged for groups of 10 or more. Our knowledgeable, engaging docents invite visitors to delve into exhibitions—looking closely and discussing works on view. Tours last about an hour, and the content can be adapted to the group’s interests. Private docent-led tours for parties of fewer than 10 are also available. Parrish curators and guest curators offer scholarly tours for groups with a deep interest in specific aspects and themes of the collection and exhibitions. Popular topics of Spotlight Art Tours include William Merritt Chase and the Shinnecock School, the works of Fairfield Porter, and in-depth tours of special exhibitions. To arrange for a school group tour please contact Cara Conklin-Wingfield at wingfieldc@parrishart.org or 631-283-2118 x 121. Visit the Schools section.